A "Nata" is a very versatile tool for use in gardening and forestry. It is used to chop kindling, cut or prune trees and bushes, and for splitting smaller logs, and debarking. Nata are normally sharpened only on the right side of the blade, so they can be used to prune branches right at the stem or trunk of a tree. The heavy blade is made of two layers, a hard carbon steel to form the cutting edge forge welded to a softer, tougher, iron back for strength and durability. This top quality axe is forged in SKS-51 (JIS) steel and its special Genki rubber grip absorbs the shock very well: the vibrations are hardly transmitted to the hand or arm. The Silky hatchet was designed to keep its edge longer, even with continual use. The removable non-slip Genki rubber handle is designed to reduce impact on the hand by up to 60% making the Ono ideal for heavy duty applications. The blade is perfectly weighed to swing smoothly to ensure a very efficient cut. Ideal for de-limbing or chopping and splitting wood. Product descriptionChopping is often faster than sawing or cutting. The NATA is a cross between a kn.. Product descriptionThe Ono axe comes with a non-slip rubberized handle which absorbs the impact and .. Product descriptionThe mono-construction blade of the Ono (18cm) can be easily replaced without the .. 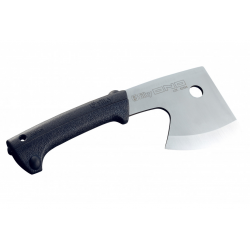 Product descriptionThe Yoki billhook comes with a non-slip rubberized handle which absorbs the impac..